UPDATE: November 8. Robert Wehrman's biography will be published soon. In the meantime he's revised Walking Man website with a new video and other information. Over the years I've read many superb outdoor books. 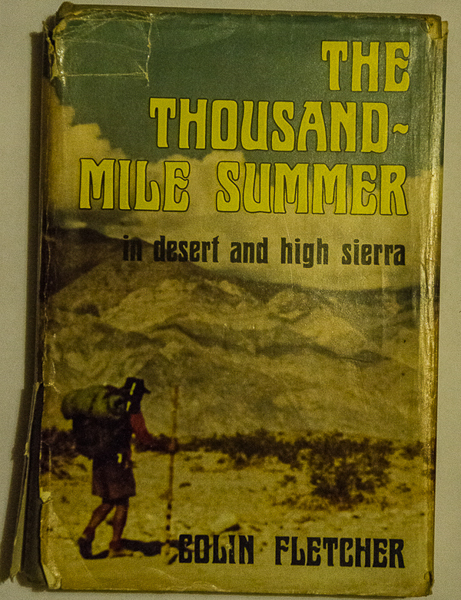 My favourites though are those by Colin Fletcher, especially The Thousand-Mile Summer, about a walk the length of California, which inspired my Pacific Crest Trail hike, and The Man Who Walked Through Time, about the first-ever walk the length of the Grand Canyon, which inspired my Arizona Trail trip. I've written about Colin Fletcher a few times, including in this piece, which won an award from the Outdoor Writers and Photographers Guild. Whilst the books convey Fletcher's love of walking and wilderness there's not actually much about the man himself, who died in 2007, outside of the walks. Who was he? How did he come to do these walks? What else did he do? Someone, I thought, should write a biography. And now someone has. Well over a year ago I was contacted by Robert Wehrman from the USA who was doing research for a biography of Colin Fletcher and looking for those who Fletcher had influenced. It's not hard on the internet to discover that I'm one. I supplied Robert with some quotes for the book and put aside the excitement I felt. The book wasn't yet written but I wanted to read it. Now the book is written and Robert Wehrman is seeking to raise funds via Kickstarter to publish and market it. This is a very worthwhile venture and I hope the money can be raised. I really want to read this book! In fact I want to do so even more now that I've been priviliged to read a few extracts. Anyone who's interested in wilderness walking and backpacking should find this book fascinating. Colin Fletcher had a huge influence and is an important figure in the history of hiking. More than that he's one of the best outdoor writers and an inspiration to many of us. Here's the link to the Kickstarter page, which contains a short video that is well worth watching. As an eminent iconoclast writer, he inspired millions to follow his tracks out of the cities and into wilderness. Hey Its not written yet, But the time not depends on man right? Whatever is going on with time is my opinion! Time is decides us.